AUBURN HILLS, Mich. — The Detroit Shock announced Friday they have matched the offer sheet Kara Braxton signed with the Los Angeles Sparks. Details of Braxton’s contract were not released. She is a native of Jackson, Mich. The 24-year-old former Georgia star was selected by Detroit with the seventh overall pick in the first round of the 2005 WNBA draft. She has averaged of 6.7 points and 4.2 rebounds in 131 games. 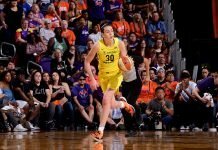 Braxton averaged 8.9 points and 5.1 rebounds in 33 games last season, helping the Shock win their third WNBA championship, and second in three years.